SHIPS FASTEST: In Black Paloma Leather. Ships in 2-10 days in Chocolate, Metal Grey or Sparrow Blue Paloma Leather. Now is a great time to save big on the world's most comfortable recliners. Choose your favorite leather grade, pick one of the fabulous colors, and match it perfectly with a wide assortment of different wood options in your preferred size. 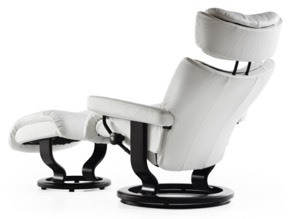 The Stressless Magic Recliner by Ekornes is beautifully designed and exquisitely modern. To view any of the amazing leather or fabric types and colors the Stressless Magic Recliner can be purchased in, simply use the pull down menu above, which is titled: "Select Leather or Fabric Type and Color". The price of the Magic will change based off of the leather or fabric type and color chosen through the pull down menu. Why not add a functional accessory to your new Magic recliner? These include: the ultra-convenient Personal/Laptop Table, the useful Ellipse Table, the stylish Urban Table, or the fan-favorite Elevator Ring set. Pricing is reflected automatically when you make your leather selection from the swatches above. Need assistance- Please call 1-888-486-9463. Enjoy Fast, Worry-free Delivery on a Stressless Magic Recliner Large Classic Base with Ottoman. Start relaxing in your beautiful new Magic Large recliner sooner with our Quick and Easy Shipping Methods. It's a great time of year to purchase from the amazingly comfortable, Stressless Magic line! This popular, modern recliner delivers exquisite head, neck and back support and the over-stuffed smooth, soft, cushioning allows you to sit undeterred for many hours on end. The Stressless Magic Large recliner is among the most modern Stressless recliners available. Now use the pull down menu above, which is titled: "Select Leather or Fabric Type and Color", to select your preferred leather of fabric type and color. Then choose from the beautiful wood stains. Typically, we keep all stains in stock. *Would you prefer to receive your Magic recliner faster? Choose one of our other speedy delivery methods. The Magical Stressless Magic Recliner with Ottoman by Ekornes (large size). Learn about Inside Residential or White Glove Delivery! Like its magical smaller brother (the Stressless Magic Recliner- Medium) the Stressless Magic- Large, is produced by Ekornes in Norway and is one of the newest additions to the Stressless Recliner lineup. Once you sit down and let your body sink into the extremely soft cushioning, you'll know that you've reached a level of comfort you could previously only imagine. The large Stressless Magic is truly one of the most comfortable recliners ever designed by Ekornes. Talk about stylish. 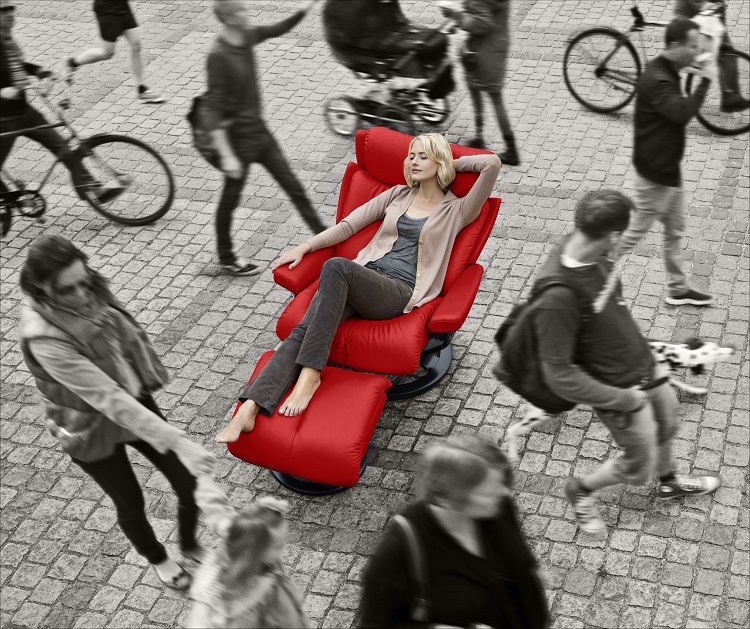 The Stressless Magic large looks as great as it feels. When you sit down, prop-up your feet and experience true Norwegian comfort, no other recliner will do. It's easily overlooked that the Ekornes Magic Recliner brings home the same back and neck-saving features that all Stressless Recliners and sofas are famous for throughout the world! 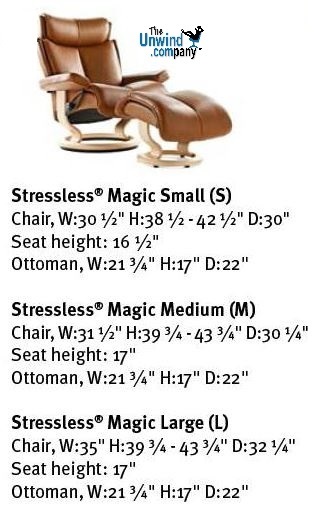 Want to see informative Ekornes Stressless Magic large videos? Visit our Ekornes Stressless Magic video channel on YouTube. Or Search and watch 100's of Stressless recliner videos at The Unwind Company YouTube site here. The large Ekornes Stressless Magic recliner offers great comfort and support- especially to those who are of above-average size and weight (warranty is valid for weights up to 350 pounds). SHIPS IN 2-10 DAYS IN: Black, Chocolate, Clementine Paloma, Light Grey Paloma, Rock Paloma or Sand Paloma Leather; Or Amarone & Tigereye Royalin Leathers. SHIPS IN 60+ DAYS IN: All other fabrics & leathers (these are special order colors). We invite you to grab a book, kick-up your feet and sit in the large Ekornes Stressless Magic for a spell- You'll be glad you did- we guarantee it! - Stressless Recliners and Accessories are built to last for many, many years (many of our customers have had their original Stressless recliner for more than 30 years- and they are not looking to trade them in). - The unique, round wooden base insures stability and is extremely durable. -Stressless Recliners are always created for a custom fit- Many Stressless recliners come in three sizes (small, medium or large) and many sofas are available in two sizes (medium or large). The Magic Recliner (large) is comparable to the large versions of the other Stressless recliner lines (Ekornes Stressless Jazz Large, Stressless Kensington, Stressless Blues Large etc). 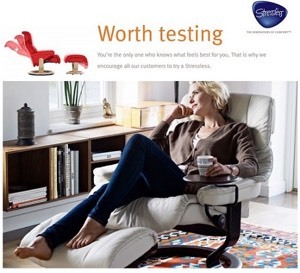 Both the Ekornes Magic Recliners (large and medium) share the same attributes. For best results, take a seat and let us help you determine which size will ultimately offer the most comfort and correct support for your individual body size and weight. We are also able to assist you over the phone if you're too far away to visit. Come visit the Unwind Back & Body Store to experience the large Stressless Magic Recliner for yourself. If you have already decided and are ready to purchase, simply click the "Add To Cart" button below after selecting the available options. Please review our return policy prior to ordering or call 1-888-486-9463 or 1-601-932-5111 for personal assistance. You may also email stressless@unwind.com anytime- 24 hours, 7 days a week. Did I really spend that much for a chair??? Yes. No (big) regrets. It's quite comfortable and great for working in. I just wish it weren't SO pricy. It seems to be about 25-30% more than it should be. Unwind has been great! My local-ish dealer couldn't have seemed less interested in taking my $$$$$ for an order that would have taken WAY longer than it took Unwind to get it to me. Oddly, the chair started out a bit uncomfortable, but now that my body has readjusted to sitting how it should ... I find it GREAT! I'm buying lottery tickets and hopefully my luck will change. If it does I'm getting this chair first thing! I love the Magic chair! This is my favorite of all the Stressless recliners that my wife and I have tried so far. The accessory promotion is making this very enticing. Fathers Day gift? Saved up and was finally able to take the plunge and buy a Stressless Magic in the large size. I love the extra padding and adjustable headrest. It seems to be very well built and I hope it lasts me the rest of my life. Unwind was fantastic to deal with as well!